I pulled the High priestess from my Ryder Waite tarot deck. It’s the deck I learned to tell the cards with and its still my favorite because it incorporates so many plain, simple and universal symbols. However, I have a problem with the tendency, imposed by our culture, to rank everything in stereotypical orders of hierarchy. My priestess is not about that, she would not allow the designation “High” with all it implies to be attached to her title. 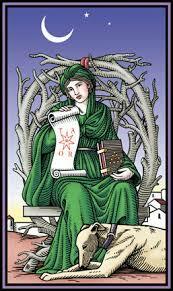 After I wrote my initial paragraph-timing the writing, never taking pen from page, extracting the phrases which held the most juice, and writing the poem-I went looking for an image of the card I pulled, hoping to insert it in this post. Having found her, naturally I scrolled down to look at the rest. This one immediately caught my eye. I can’t tell you her provenance. I wish I knew, but she comes from a Pinterest page with no attribution. 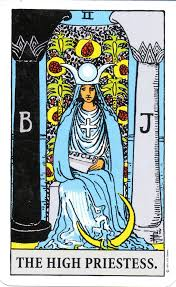 It’s such a beautiful card and exemplifies the priestess in my poem – complete with dogs!! Synchronicity comforts me with its implication that magic is indeed afoot. So here’s to the Living Goddess and the priestesses who serve Her! of judgment becomes ever more quiet. in the restless brains of those she serves. who destroy their cocoons to enter life. Death in Life/Life in Death. between seen and unseen, known and unknown. This entry was posted in Archetypes, Daily Prompt, Herstory, Myth, NaPoWriMo, Politics, Ritual, Witness, Women and tagged dogs, goddess, Hecate, High Priestess, Isis, NaPoWriMo, National Poetry Month, Persephone, poetry, priestess, ritual, Ryder Waite tarot deck, witness, women. Bookmark the permalink.